You're shopping with us, you're already a step ahead; IoT and You. The Internet of Things is a notion of a new age of internet connected devices. It stands to be a great time in technological advancement. You, as our customer, are in a position to get into it from the beginning. Okay, so that title is a little over the top, but it's part of the point I'm trying to make. To preface; I've got two talks on IoT topics coming up; I'll be at IoT Summit at the end of this month and IoT World in the middle of May. So my mind has been on the Internet of Things recently. There's a lot of ways this new industry is going to benefit us in the maker/hobbyist/prototyping community (electronics civilians). Data only cellular services seem to be getting more accessible. There will hopefully be a push for cheaper, lower power microcontrollers and radios. Along with this, battery technology will hopefully get a bump. Talking to people within the electronics community, it won't be outlandish to have sensors which can be completely isolated with no maintenance in their lifespan (think of moisture sensors that can be drywall-ed over in a house). But the IoT community stands to benefit a lot from us as well. IoT encompasses so many sub-topics; Wearables, Smart Grids, home automation, and wireless beacons to name a few. Most of which, I have seen projects relating to on Hackaday and similar blogs. The things companies are looking to accomplish with IoT, our customers have been doing for years. Connected devices are nothing new to the hobbyist world, now there's just a name and an industry push behind it. Technology will improve, but the concepts will remain the same. If there's one resource on this planet that IoT could benefit from, it's the hobbyist/maker community. While the big tech companies were doing their best to keep up with mobile phone technology, we've been working on ways to interface with them. 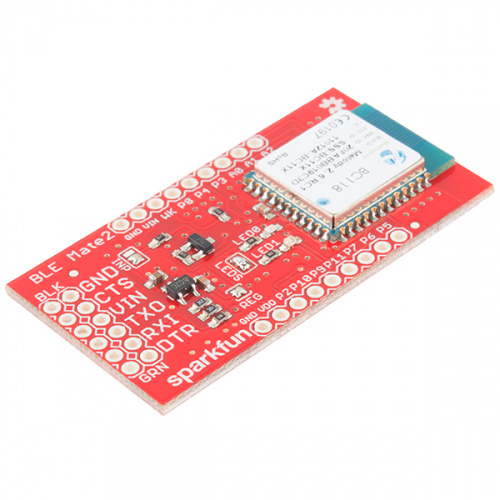 We have the experience with microcontrollers needed to make devices that can have their firmware updated on the go. We've had to troubleshoot devices that rely on GPS. We have skill sets that put us in a great position to do well in the world of IoT. Our BLE Mate 2, a great way to get into Bluetooth Low Energy (4.0), which will be an integral part of connected devices. So that's why I am writing this article, to ask you, the reader to use these skills for good. Boulder, Colorado is teeming with startups at the moment, we're even rivaling San Jose. A friend of mine has a startup currently focused on an emerging industry here in Colorado (yes, that one). I was talking with him the other night about it and he had expressed some grief relating to the people he's encountering in that line of work. He feels that most of which are in it for the wrong reasons. They're the people looking to get in on explosive growth and bow out when the market stabilizes. While they're completely different situations, I fear the same of IoT. I hold concern that it has the potential to be the sum of everyone's fears regarding a fully connected home (insert T-1000 reference here). Around the office, I talk about how great IoT has the potential to be. People get upset at the idea of it. They see it as an invasion of privacy and it's met with resistance. Pete making the face he makes when I say his fridge is going to be connected to the Internet. Thanks for being a good sport about this, Pete. So what I am asking is to use these skills as more than a hobby. Yes, a good sample of you already do have careers or plan to have a career in the electronics industry. IoT is a great opportunity. The next time you solve a problem that you've encountered using the power of electronics, consider if it could be a product that solves that same problem for others. Make your projects products. Keep an open mind about ideas in the IoT field. You may feel it's a silly concept, but you have the power to change that. To use these new and existing resources to solve problems through connected devices. I know I say this every Enginursday post, but one of these days I'll have a cool project to share. I can certainly see, and mostly agree, with Pete. It behooves us to be VERY careful about what data our IoT actually exchange with the outside world. Take the fridge: I can see some usefulness to having it be able to send a text message to my cell phone (or maybe an e-mail to my office computer, or both) if the temperature goes above some value, prior to the food spoiling, so I can head home and (try to) correct the situation. Controlling the temperature in the fridge? Don't be ridiculous -- that gets set when the fridge is first installed, and never needs to be changed, and should only be changeable by turning a physical knob. On the other hand, maybe being able to get a current picture of the interior, so I can check the level in the milk bottle while I'm walking through the grocery store might be useful. Like just about everything, or at least every new technology, it can be used for good or for evil. (Example: Back in the 1920s, it became obvious that automobiles could be used to commit crimes. Should they have been banned?) It is imperative that we, who are "bleeding edge" users, take some care to do what we can to limit the "dark side". I think a big part of security with these types of devices will be setting things up so they are only available through VPNs or other traffic encapsulating techniques. Once IoT devices move to IoT (Intranet of Things) where there is a single, highly-secured point of access with the outside world then security will become a lot easier to maintain. Both because it's far easier to secure a single point of entry, and because the burden is (largely) removed from the 'Things' and instead rests on what can be a much more powerful piece of equipment. I see great utility is some of the things that can be done with networked devices. I can monitor power usage in my house. I can control individual vents in my HVAC system, not only to make sure I'm not heating and cooling rooms needlessly, but that I am also getting enough volume through the system for it to be working efficiently. All that kind of stuff is great. What is not great is that I have to open the whole thing up to the outside world to use the products. Somewhere along the way, products stopped being an end unto themselves and started being a vehicle for mining data about users that could be further monetized. Having to sign up with some random company storing data in "the cloud" just so I can set my thermostat is a non starter. The, we get to the command and control part. If you put something on the internet, it will be hacked. Just a matter of time. Someone will break in and make it do something unintended, just because they can. I'm not talking about malicious actors. There are over 7 billion people in the world. The combination of brilliant, bored, internet connected, and curious factors out a lot of folks, but even one hundredth of 1% is still a lot of people poking around just to see what they can do. Unfortunately, the side effect is not to make products more secure and tamper proof, or only connected to the outside world if absolutely necessary. The side effect is knee jerk laws and regulations that make doing the same things on stuff you own illegal. In short, I see a number of positives from connected devices and a tsunami of negatives. Now, get off my lawn! While the IoT privacy concerns are bad enough, they're not what's keeping me awake at night. After all, we are almost fully transitioned into a post-privacy society. A few more years of being trained to overshare on facebook and it won't make any difference. My fears are for when IoT is used to control things instead of just monitoring them. The possibilities for disaster go up exponentially. We don't even have to invoke terrorists. Buggy code and poor hardware design will do it for us, especially when ComCast is the main data and control channel. And when the system is working, that just means that anyone who can connect to our hardware can run our lives. Then, in addition to that, hobbyists are great folks and have some really neat ideas, but they are not necessarily good control engineers, systems designers, testers, documenters, etc. and most have no notion of information assurance and anti-tamper. At least not without some kind of professional training. So that's my reaction to an IoT put together by hobbyists. Sorry Pearce. I do want to make a point that IoT is not just limited to a Fitbit type device, or a smart watch. It's really anything that will utilize the Internet. It encompasses ALL semiconductors that can be used for communication (GPU, CPU, MCU, FPGA, SoCs, etc). When you think of IoT, don't just think of Arduino, but think of anything that can be tied to the Internet for a purpose. There are quality assurance, web design & back office services in Boulder. In exchange for mountains, most of us would have very boring jobs in Boulder, compared to what we can do in Calif* with a lot less qualifications. The Bluetooth IOT spec is a complex beast. With every new standard exponentially more complex than the last one, it's amazing new standards can succeed at all, but they do.